Oxford, Portsmouth, Le Havre, Marseille, Tunis, Taleb Larbi, El Oued, Hassi Massoud, Illizi, Djanet, Mt Tiska, Erg D’Admer, Oued Sersouf, Mt Tazat, Amadror, Garet El Djenoun, Tefedest East, Tam, Ain Salah, Ghardaia, Taleb Larbi, Tunis, Marseille, Oxford. The last time I was in Algeria was in late 2002 on a round trip of the south in the fuel-dump stage of the Desert Riders trip. 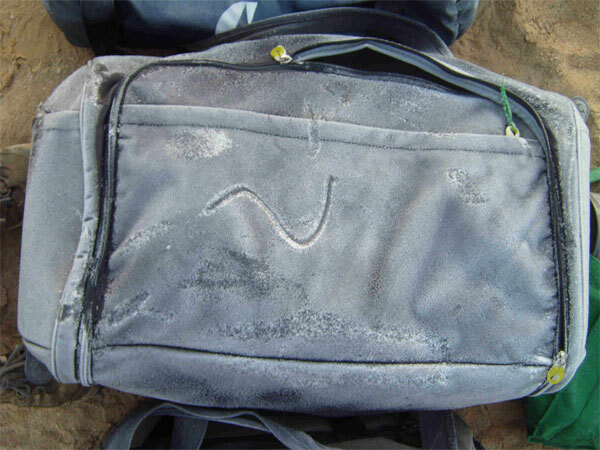 The kidnappings in March 2003 in the Algerian Sahara led to a bit of a wait-and-see approach for me but provided the opening for desert trips to the Gilf (2003/4), Chad (2005) and Morocco (2005/6). The combination of time-elapsed-since-kidnappings and a relative disappointment (I was warned) with Morocco’s desert (though not the country), resulted in a return to Algeria. To be fair, the decision was more than helped along by our extended Australian family’s curiosity with the Sahara and their idea that we all get together there in the winter of 2007/8. Happily we did, making it my 6th visit to Algeria. The desert there is better than ever. We followed the usual route down to Djanet in the south-east via the sealed roads from the Tunisian-Algerian border at Taleb Larbi, taking about 4 days from the Tunisian border. There’s more on this part of the trip, including the state of the road, status of the check points and so on later in this S-File. We spent a good two weeks knocking around the Djanet region, including both day and overnight trips. Djanet is a great setting for this sort of thing – the landscape within 100 km is astonishingly varied. We went up the Tassili escarpment on an overnight walk with donkeys, out to Mount Tiska a couple of times – including a brief visit to the great northern Tenere plain, several nights in the canyons west of Djanet (Sersouf), a day in the Erg D’Admer as well as a few evening braais (South African for bbq) in scenic spots around Djanet. 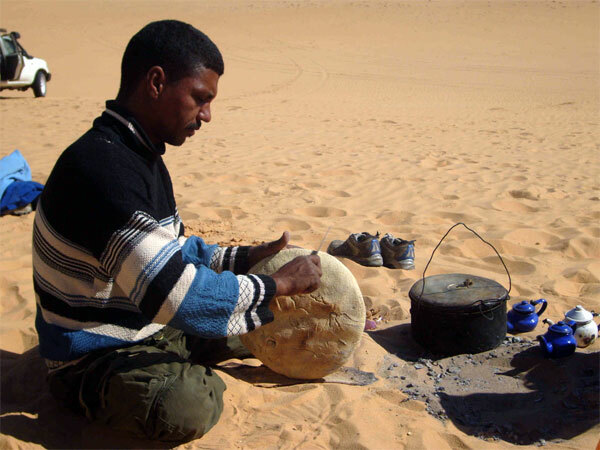 During this time we either camped out in the desert or stayed in the Hotel Tenere – a break from the usual Hotel Zeriba. Actually we did spend a couple of nights there. The Zeribas are all but gone and the nights pretty noisy (dogs go from 11-2, chickens from 2-5, and then the Mosque wakes up the truck drivers). But Zeribas is still a nice location in the heart of town. Hotel Tenere was a pleasant surprise. Working out at about 10 euros per person for a 4 person bungalow, we enjoyed the peace and quiet, awesome views on the breakfast balcony, and freedom to cook up our suppers in the quiet hotel gardens. The place had always been a ghost town when I passed by on previous trips. It was this time too, apart from the nights when aircraft landed in Djanet – then it was fully booked for a few hours (the flights arrive after midnight). Our Djanet to Tam route took in the pass just north of Mount Tazat on A7 in Sahara Overland, two nights at a beautiful spot just west of Tazat, a day driving up the old truck piste from Djanet (A7 in Sahara Overland) and on to the centre of the Amadror plain (a striking camp in the middle of nowhere), on through to the Tefedest East valley, a couple of days on a detour north to Garet El Djenoun from where we headed south to Hirafok back along the Tefedest east and then west across the corrugated piste to the sealed road to Tam. It was a purposefully slow drive, taking a full 7 nights to do what many parties would want to cover in three days. But this part of the Algeria trip was the highlight of the holiday and, increasingly, the pace at which I enjoy moving through the desert. On the days when we did drive we got going at 10am and finished by 2 or 3pm – some days a lot earlier. For the leg from Marseille to Djanet I was joined by Spook. Meg, our two children, Josh (7) and Kate (4) flew into Djanet via Paris and Algiers, along with Meg’s sister (Clare), her husband (Mike) and their children James (about to start uni), Nic (16) and Rob (12). 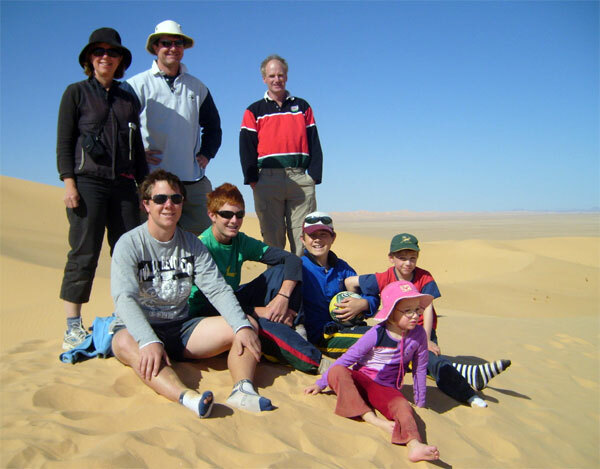 The age range coupled with it being Clare and Mike’s family’s first desert trip made me wonder how we’d fair, especially for things like the Tassili escarpment walk. Kate and Josh are probably amongst the younger tourists to have made it up the Tassili escarpment. Josh made sure he walked up and down while Kate took advantage of Meg’s fitness with long piggy back rides. Kids this young tend to focus on the very small scale. This became obvious to us when looking through the extremely detailed diary that Josh kept during the trip. He seldom commented on the grand views or the expanse of the desert but wrote a lot about our camp sites, cooking on the fire, the Algerians who were with us and so on. Josh was absorbed for hours looking for bones, old pottery, fossils and unusual rocks around the camps and, towards the end, went off with Kate on longer walks up surrounding hills. Having a camera also kept him busy. We also took a rugby ball and cricket bat which kept us all entertained for hours. Kate was perhaps less interested in the desert itself. For her, having the company of an extended family for 24 hours a day was a great treat. One indulgence we took with us was a portable DVD player. Kate watched the Sound of Music often enough to learn the words to most of the songs. There is no doubt that this helped us through some of the longer driving days. The children slept some nights in a tent, some nights under the stars and many nights on the mattress in the back of the Land Rover. This provided them with a cosy and familiar setting which was marginally warmer and certainly less windy than outside. There was never any hint in the time we were there that the children were not having a great time. Without exception, the Algerians were simply great with the kids, and Mike and Clare as uncle and aunt, were very helpful and attentive which no doubt helped. A question the people I work with always ask when they hear I am heading for Algeria goes along the lines of “so what do you do all day when you’re in the desert?” I think there is a general concern that you’ll be bored out of your mind. Funnily enough, we were all too busy in Algeria for the question to arise. The desert just seems to soak up your time in a nicely passive kind of way. The sealed roads through Tunisia were excellent, better than I remember them on previous trips when there was a lot of construction going on either side of Gafsa, The good roads allowed us to reach the Algerian border from the port in Tunis on the same day. We arrived at Taleb Larbi (Algerian border) at about 10:30 pm having docked in Tunis shortly after noon. That night we slept near the Algerian immigrations building having exited through the Tunisian border. Unusually, the Tunisians kept us waiting about an hour before stamping our exits. They checked and re-checked our papers while heading off to the Land Rover a few times without doing very much when they got there. It wasn’t ever clear what the problem was though we speculated that arriving in Tunis port and then checking out of Tunisia a few hours later had scared the horses a bit – especially when we’d asked for a 12 day stay – as you do in case the Land Rover wrapped itself round a camel on the way passed Gafsa. Processing through the port in Tunis wasn’t too bad – taking just under 2 hours, slower than it might have been because Spook needed to get a visa for his S African passport. It continues to amaze me though, that there is no readily apparent system for dealing with immigrations and customs in Tunis port. The ensuing madness of cars, converging lanes and hooting makes it seem like its all happening for the first time. That said, getting on to the Ferry in France was little different. First we were sensibly shuffled into two lines, one for Algiers and one for Tunis. A little later on the lines converged from 10 to 1 as we went through immigration but not before the cars were put through an S-bend carefully calculated to be too tight for most 4X4s. Its not easy reversing in an S-bend with 5 lanes converging to one. Getting off the ferry from Tunis in Marseille on the way back had its own surprises too. Lanes of cars were dealt with in order by immigration officials in booths – a sensible approach given that cars at least stay in order that way. A key problem at the Tunis end is that drivers are processed away from their cars. Needless to say, people from the back of the car queue can be dealt with before those whose cars are ahead of them in the queue – so lines of cars tend to become a jam of angry drivers who can’t move in any direction because many of the drivers are still on foot in the queues. It was good to see that the French had this part of the production line sorted out. But French customs instead had something in the pipeline for us. They were stopping cars in the lanes and searching through them so that the entire queue of cars had to wait until the cars in front had been cleared. We watched in amazement as a panel van was unloaded in front of us and every bag and hiding place in the van thoroughly searched. After that we were waived through in a second. But why not pull these cars out of the queue first – and then dismantle them? That would save everyone a couple of hours and there was plenty of room to do so. Algerian sealed roads are a mixed bag. The Taleb Larbi to Djanet and Tam to Taleb Larbi (trans-Sahara highway) sealed roads seemed to be in a much worse state than in any of my previous visits to Algeria. In particular, the road at the south end of the Fadnoun plateau (between Illizi and Djanet to within about 50km of Djanet) is badly broken up and cost us a good tyre and tube, even with slow and careful driving. I was also surprised at the condition of the road south of Hassi Massoud to Hassi Bel Gebour. This stretch takes a lot of oil traffic now and is a pretty poor state. With the oil price having trebled since I was last in Algeria and with the industry making heavy use of these roads, one wonders where the cash is going. Likewise, the sealed road between Tam and Ain Salah, apart from a new section 100 km north of Tam, is full of deep pot holes. It is particularly bad around Arak where the problem of the river and the road sharing the same valley still hasn’t been sorted out. It looks like they are having a serious go now though, with some complicated elevated sections under construction. But then they were busy with this in 2002. Our drive north took us from Ain Salah to Ghardaia and from there on to El Oued and Taleb Larbi. At Dahaj (from Tanezrouft’s) recommendation, we took the road 40km north of Ghardaia before turning east through a string of pretty Berber towns via Guerrara on a smooth, quiet and very scenic alternative to the Ouargla route through from the Trans Saharan Highway to El Oued and Taleb Larbi. This route is not only more interesting but cuts out that demoralising southward dogleg west of Ouargla on the way to El Oued. There were also no military checkpoints between Ghardaia and Toggourt. Its still all Toyota, Toyota in Algeria. The shops in Djanet and Tam seem to have more spares than ever. Fuel queues in Tam were back – or never went away. Luckily we had the range to get north to Arak on Djanet fuel otherwise it would have been about 2 hours or more of waiting for us. A marked change from 2002 is the amount of traffic on the roads at night. We slept about 3km off the road about 15 km south of Hassi Massoud but could hear the trucks on the road throughout the night. I remember the traffic pretty much stopping at sunset on these stretches before. We also drove at night, leaving Ain Salah at midnight (for reasons that I will explain later) and arriving in Ghardaia at about 9am. This all seemed OK with the checkpoints along the way and we passed traffic throughout the night. SNCF are running a new ferry on the Marseille to Tunis line – the Danielle Casanova. She’s not exactly new, having served on some other route for a few decades – probably the run out to Corsica. But she’s bigger, most likely faster and quite a bit grander than the Liberte which used to ply the crossing to Tunis. A ‘new’ line is also running from Portsmouth to Le Havre (LD Lines) with fewer crossings per day (just one) compared with P&O. The invitations, permits, two Toyotas (for the Djanet to Tam leg), drivers and guides necessary for an Algerian trip these days were all arranged by Tanezrouft Voyages. Our itinerary was complicated. It included two arrival dates for our party, one in our own car, three departure dates and several unique groups of names for the various legs (two arriving in Taleb Larbi, one leaving in Djanet, 8 arriving in Djanet, 7 leaving in Tam, 2 leaving in Taleb Larbi!). The paper work was taken care of by Yves at Tanezrouft and any changes, including a few that we had to make late in the day, were resolved very promptly. The Tanezrouft drivers (Dahaj and Moktar) were the best you get for these kinds of trips. Their outlook and temperament are very well suited to desert driving and desert trips. They obviously enjoyed being in the desert, were ever patient and unhurried, good with the kids, and sensitive to us wanting to drive slowly and take ages over the piste from Djanet to Tam. They were not once late. Srouffi, the guide provided by Tanezrouft, stayed with us from Taleb Larbi to Tam. Srouffi is a lovely man who knows the pistes extremely well. He went the extra mile in looking after us in the camps, especially around the fire on cold nights. He is quite a character. Overall it would be a priority for us to work with Tanezrouft on our next visit to Algeria. We took my old 1970 Series 2A 109 Land Rover (petrol 2.25L) from the UK but also had two Toyotas from Tanezrouft for the Djanet to Tam leg. The Toyotas were a pair of Landcruisers, a GX 80 series with 400 000+ km on the odo and an 80 VX with about 250 000 miles. The VX did the job in a comfortable VX kind of way. It does sit like a frog when loaded though. The extremely cold weather led to an oil leak near the front pulley which was active for a few days but went away once the weather eventually warmed. The Land Rover went fine, covering the 10 000 km return trip without any majors. Only the routine manifold gasket job half way through the trip in Tam caused us to get the big box of tools out. I say routine because this bug crops up every 4 000 km or so – the back exhaust outlet burns through on the manifold gasket and it starts to sound like a Merlin engine after that. Anyone who knows what could be the cause, do let me know. I’ve changed the inlet and exhaust manifold itself (not just the gasket) twice now and three different people have been involved in doing the job. Anyway, its easy enough to do and gave us a bit of street cred at camping Dassine in Tam when our sleeves were rolled up. 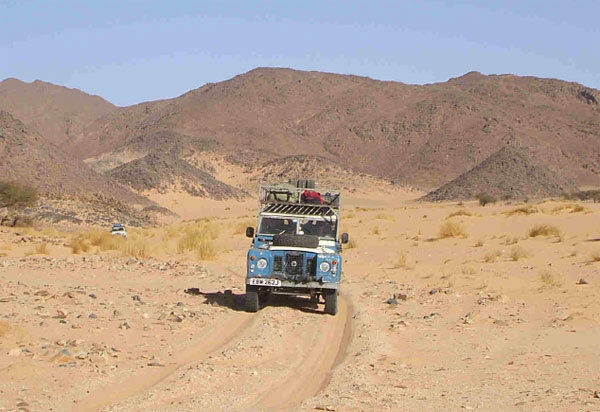 We had two punctures on the Land Rover – the first on the Fadnoun plateau which ruined the tyre too. The second in the middle of the Amadror which we fixed that night. Like many others I have thought long and hard about the number of spares to take. For the last three Saharan trips in the Land Rover I have settled on one made up spare and one additional tyre with no rim (plus a few tubes). The reasoning is that its easy enough to fix punctures (providing one has some levers, patches and so on) but its very unlikely that a rim will become impossible to repair – especially steel rims. I carried 2 made up spares on over 70 000 km of piste on previous trips in the Land Rover, but never needed them. The Land Rover had a couple of interesting and unique tricks too. One was a potent smell of petrol which was beginning to strip the last of the blue paint work off the doors it was so strong. The issue had started in Morocco on an earlier trip and I thought I had it sorted after changing the back tank (which was obviously leaking) and adding some additional seals to the fuel caps (the Land Rover has 3 on-board fuel tanks). Everything smelt like roses when I did the test drives round Oxford in the summer, but by Hassi Massoud it was clear that Spook’s eyes were starting to water in the passenger seat. We by-passed the complicated fuel delivery set up (involving tank switch and independent fuel pumps and filters) with new fuel line all the way from the rear fuel pump to the carb – and still it stank! We finally diagnosed the problem in Sersouf canyon near Djanet where we noticed that the stink was a lot stronger with a closed throttle than an open throttle – a bit counter intuitive really. It turned out that the new replacement Weber carb had some kind of an ill-fitting adapter collar where the air filter pipe joins it. When hot enough, the adapter collar becomes loose, allowing the entire air filter pipe to detach along with the collar from the carb top. Removing the collar made for the simple fix. It probably never got warm enough round Oxford in the summer for the problem to develop. So we’d spent all our efforts looking for leaks in the fuel line when the problem actually lay in the air feed. There’s something new on every trip and, as they say, its never over in a rover. The Land Rover also developed a leak in the exhaust pipe just short of the silencer box. This was sorted out in Tam by the first set of fixers on the right hand side on the way in to Tam from camping Dassine. They are worth a mention because they took the pipe and silencer box apart, welded in a replacement piece of pipe (found on the roof of a house nearby) and welded it all up again over the course of 2 hours, asking only 8 euros for the job. There is nowhere I know of near Oxford that will do anything other than throw away as many sections of exhaust pipe as they can and bolt on new parts while some gum- chewing youngster with spots and a bolt through his eye rubs runs up an outrageous bill. No one welds exhausts where I live anymore. So hats off to the guys in Tam. That’s where I’m going next time the exhaust develops a leak and I find myself in the UK. While the Land Rover threw up minor niggles to keep us entertained on the long sections, the GX had a more spectacular episode coded up in its DNA and ready to be unleashed at 426,515 km. About 100 km out from Djanet the GX transfer box shaft opted for its very last rotation. The car stopped so suddenly in front of us that we nearly absorbed the Toyota’s spare tyre in our front grill – it was all we could do to miss it. The box was terminal – actually Moktar had been struggling to find both first and second gear ever since the aging GX had arrived in Djanet. I was a bit surprised that it was the transfer box that finally finished it off. After we had disconnected the front and back props – which hilariously involved Srouffi – not much of a mechanic on a good day – as chief conductor and interpreter using all the 11 French words the team had by then worked up in common, the VX towed its work-horse counterpart to Djanet on a very short 4m strap I’d dug out of the Land Rover. With a delay of a week likely to replace the box (which eventually came via Tam from Ouargla), Dehaj set about finding a replacement car. This is where Isak from Djanet (not his real name) with a newer GX belonging to his brother, stepped in to help and Moktar, sadly, vanished from the scene for a couple of weeks. I have to say that Dahaj and Moktar alike did nothing but reassure us that everything would be fine and that our schedule would be unaffected – more than I would be capable of if my transfer box had just jammed solid such a long way from home. The substitution of cars and drivers led to a bit of an unusual situation because Isak was not in the employ of Tanezrouft, other than in an ad hoc sub-contract kind of way –as far as we could tell that was- and the car belonged to someone in his family. So when, during the rest of the trip, the day’s driving was done, he felt as though he was free to do what he liked with is families car. Which, in fairness, he was. At least until an event on the Amadror plain changed things a little. Isak had been on a number of ‘drives’ on his own to go and ‘fetch firewood’ since he joined us in Djanet. He normally came back to camp with firewood although it had never been necessary to fetch any as we’d always camped next to trees where firewood was plentiful– as you so often do on these trips. We knew it wasn’t the real reason he went off, but it never resulted in anything more than a topic of curiosity amongst us. We arrived in the Amadror plain campsite at about 4pm – one of our longer drives. Within 5 minutes of getting there, Isak went off to find firewood. Anyone who has crossed the Amadror plain knows that there just isn’t any. We hadn’t seen a tree in about 100 km and the landscape is flat, empty and stark. When he wasn’t back 3 and a bit hours later, Srouffi began to worry in as much as Srouffi ever worried about things. Also James and Nic were without some of their kit as they’d been travelling with Isak that day and he’d left so smartly that it hadn’t occurred to them to remove everything from the GX. Now that it was dark, Srouffi walked a few 100 meters from the camp and waved a dying-yellow head torch about a bit, hoping that if Isak was lost, the head torch would draw him home. I also switched on my Thuraya sat phone, having swapped numbers with Isak before setting off on the trip. Round about this time we spotted a number of vehicles, about 10 km away moving towards our camp. It was then that I decided to SMS our GPS position to third parties as we really weren’t sure what was going on. It turned out that Isak hadn’t been able to find our campsite in the darkness – he only found it when I switched on the headlights of the VX. Looking back, the cars we’d seen must have been on the piste from Illizi to Tam which crosses the Amadror (its not one I’d known about before). Over the days we got to know Isak better and he turned out to be a likeable guy that Josh and Kate, the youngsters in the group, were especially fond of. He didn’t come across as anything like the usual piste driver with his smart clothes, shades and leather Thuraya case. But he did help us out of a spot in Djanet at a moments notice and for that we were grateful. Taking a car down to southern Algeria from the UK is, when you add up the costs of a guide from the border, the ferries and the fuel through Europe, only marginally less expensive than spending 130 euros a day on a local vehicle. Given the wear and tear to your own vehicle, it probably works out to be a lot more expensive. But a number of things make it attractive to drive down. First, one can take a lot of things with you that are nice to have. We took camping chairs, a table, tents for nights when the wind was strong, food that you can’t get in the south (including coffee, tea, savoury biscuits, packet soup), Christmas presents for the kids, balls to mess about with, medical kit, water containers for the piste, a cooking stove, GPS, satellite phones, books for the children to read. All these things helped to smooth out the bumps but would have been difficult to include in the 20kg baggage allowance. Also, as mentioned earlier, the Land Rover was a home away from home for the youngsters. They really enjoyed sleeping in the back. It was the Algerian consulate in Canberra who rang Clare up in Sydney and asked her if she knew what she was doing taking her children to Algeria. The London office was a bit more detached but a bomb killing nearly 70 people at the UNHCR in Algiers did manage to get on the news just before the party of 8 flew through the capital on the way to Djanet. Sleepy Djanet had its own share of action a few weeks before when a group of insurgents in 3 Toyotas fired RPGs at an Algerian military plane before fleeing on foot into the hills. All of this is good news when you are about to head off because the effort needed by the insurgents to mount such complicated raids normally means that the ensuing months will be much quieter while they regroup – and the security situation heightened. To be honest it didn’t seem to be round Djanet. The night Meg and the others flew in to Djanet, we took our 3 cars and cooked supper on a fire in the desert just 5 km from the airport fence. We might well have been the return party eyeing out the Mi-17s that sit on Djanet runway. No one seemed to be very bothered and we stayed there from sunset till the plane landed at about 3am. Compared with 2002 there are certainly more barrages (military road blocks) on the sealed roads, although our passage through them was faster than before owing to the paper work (names, passport numbers, date of birth etc of all in the party) Tanezrouft dished out at every stop. Our time in Tam coincided with the President’s visit and sharp shooters on street corners and roof tops. We’d thought we’d escaped the fuss in Tam but rolling in to Ain Salah we noticed the familiar flags and hurried look on the painters tarting up the town. Our afternoon in Ain Salah on the way north was meant to be followed by an early exit the next morning but later that night rumours spread around town that the road either way out of Ain Salah was closed for 24 hours. This made me think for the first time about my own timing (having been carefully aware of everyone else’s flight dates) and it soon occurred to me that my 30 day visa was to expire in 24 hours time. A trip to the Police (guys with the blue cars) with Dahaj confirmed the road closure as well as the fact that they weren’t willing to give us a letter explaining that the road had closed and that we’d been delayed by the official Presidential visit. Whilst on the phone to Yves that night from Dahaj’s family’s house, Yves recounted the story of a party of tourist who had overstayed their visa and ended up in court. So we visited the Gendarmerie (the guys with the green cars) who explained that the road was closed but would open 100 km from Ain Salah (the big checkpoint on the way up the Tademait plateau) at 5am. This sounded unlikely given that a hit and run/bomb planter was designed to be delayed by the road closure until the president had safely left town, but it was enough of an opening for us and Dahaj kindly agreed that we could leave town at midnight on the Monday/Tuesday change over. I felt bad because he’d been away from his family and home town for weeks and here we were snatching him away a few hours later. That night was a real stinker with a blistering northerly gale, dust storms and temperatures near freezing. But we were waived through the check point 100 km from Ain Salah and all others that night too. In the end I drove from Arak (250 km north of Tam) to Nefta in Tunisia in one go. A 37 hour stretch at the wheel of the old Land Rover was enough for reality to parse through my head in strange, interrupted packets of information rather than the normal steady stream we know. It was like the jangly world had adopted a 1-3-4-2 firing order on a point gap that was way too big. Tunisian immigration were unusual helpful that night. Just as well. Mid-winter in southern Algeria normally brings warm, cloud free days and cold to cool nights. We had some of those. But almost all the nights in the south were below freezing and many nights much more windy than average. Several of the days were very dusty too. A cold, northerly wind tended to spin up the dust. I have already commented on how pleasant Dahaj, Moktar, Isak (once we got to know him) and Srouffi were in the desert. And just how helpful Tanezrouft were. So these comments go beyond Tanezrouft to the general case of guides in the desert and come, in part, from the fact that I’ve been to the Algerian desert several times on my own trips without guides, sometimes into uncharted territory well off piste. There certainly are times when having a guide adds to ones enjoyment of the desert substantially. An example is the pass west through mount Tazat which we’d done once on our own by accident a few years before. I had the GPS points for the route as well as those in ‘Sahara Overland’ (part of A7). But that afternoon we were in the mood to hand over to Srouffi and set sail for the pass knowing that he’d find the smoothest way through – which he did. Yet other times I was up for a bit of my own exploring and that becomes difficult to do because the guide loses the mojo for a while and doesn’t like not being in charge or understand what we are trying to do. It is genuinely difficult to explain an intended route to someone who doesn’t do maps, route descriptions or a GPS. Exploring is a very real part of the enjoyment of a trip like this and I keenly felt the loss of what is an important component for me. Perhaps its possible to strike a deal with a tour company in the beginning where one pays for a guide that is happy enough to take a back seat (literally and figuratively) for the trip. On the other hand maybe Saharan guides are just part of the irreversible shift towards the taming of the desert and removal of the isolation that draws one to the desert in the first place. 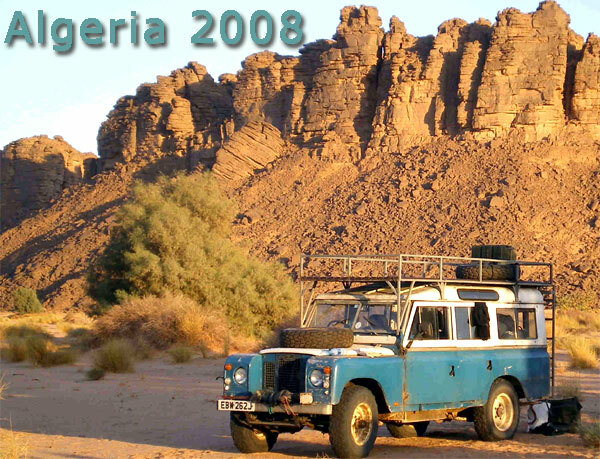 The trips I’ve done where the desert was the closest companion for us all was when we went off-piste in one vehicle with no satellite phone or GPS. The days of heading off without a GPS or sat phone are over now but there may be a way round the personality of the guide. Best days: Climbing mount Tiska with Spook and just about all the days with family. Wish I’d brought: a blanket – those seriously cold nights would have been better with a blanket both round the fire and over a frozen sleeping bag. Cheapest supper: Chicken and chips for 9 in Tam: 24 euros. 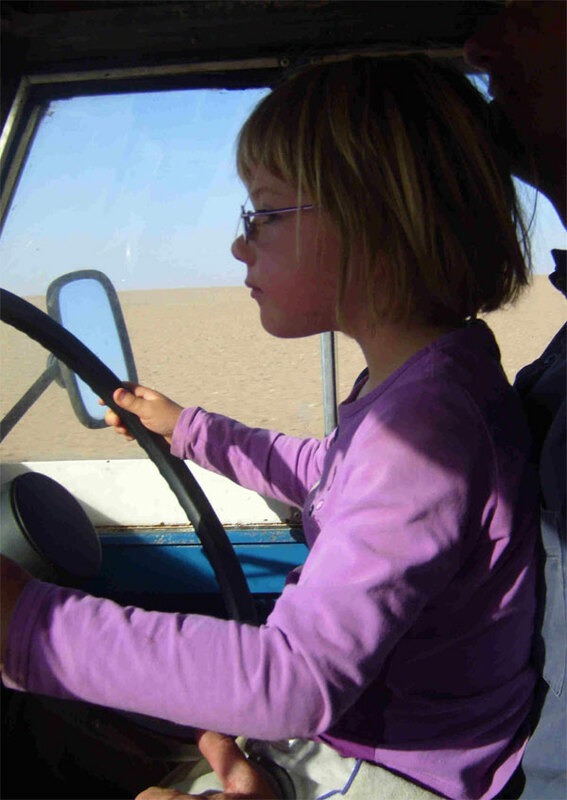 This entry was posted in Uncategorized and tagged Amadror, djanet, Erg D’Admer, fadnoun plateau, Garet el Djenoun, Land Rover Series 2A, Mt Tazat, Mt Tiska, Oued Sersouf, Tefedest East on October 3, 2015 by Chris S.